"My specialty is death," Dr. Jack Kevorkian told TIME back in 1993 as he burnished his qualifications to counsel people on taking their own lives. The white-haired, wiry physician cited his specialization and, with no evidence of humility, declared, "If not a pathologist, who? Would you have a pediatrician do it? Or let's get more absurd. What if I was a urologist? Could I help only men end their lives?" When TIME did its cover on "Dr. Death" 18 years ago, Kevorkian was about to participate in his 16th assisted suicide. By the time his own end came  in Detroit, from kidney-related complications on the eve of the 21st anniversary of his first assisted suicide  the controversial physician was said to have had a role in more than 130 deaths. He had also served more than eight years in prison for second-degree murder and had the out-of-body pleasure of seeing Al Pacino portray him in an HBO movie called You Don't Know Jack. His antics and personality brought a certain approachability to a grim subject. In one of his many court appearances, he put on colonial-era clothing to make a point about the fundamental right of terminally ill patients to choose to die. He loved to show off the Thanatron, the infamous "suicide machine" he rigged together to let his patients self-administer lethal levels of narcotics. (He had another contraption, dubbed the Mercitron, that utilized carbon monoxide.) Some critics complained that he wasn't really helping the terminally ill but rather dealing with deeply depressed patients. Others, while decrying his methods, appreciated his contributions. "Dr. Kevorkian is a crude but useful historical forerunner helping us to begin to think about how to face the management of death properly," John Langbein of Yale Law School once told TIME. At the time of Kevorkian's death, only Oregon and Washington state had legalized physician-assisted suicide; Montana's supreme court ruled it lawful in 2009. Born in Pontiac, Mich., to Armenian immigrants, Jacob Kevorkian cultivated multiple talents throughout his life, graduating from the University of Michigan Medical School at Ann Arbor in 1952 and pursuing painting and music as well as medicine. He composed jazz tunes, loved listening to Bach fugues and worked on canvases that glowered with a morbid light. But in the 1980s, he began weighing in on the issue that would make him infamous: euthanasia and the plight of the dying. He had intimate experience with the subject. "Our mother suffered from cancer," his sister Margo Janus told TIME. "I saw the ravages right up to the end. Her mind was sound, but her body was gone. My brother's option would have been more moral than all the Demerol that they poured into her, to the point that her body was all black and blue from the needle marks. She was in a coma, and she weighed only 70 lb. Even then, I said to the doctor, 'This isn't right, to keep her on IV,' but he shrugged his shoulders and said, 'I'm bound by my oath to do that.' "
If anything, a talk with Kevorkian was always full of passionate empathy for the travails of severely ill people. In an interview with Jon Hull, who was then TIME's Midwest bureau chief, the doctor stopped in midconversation to thumb through his briefcase, pulling out letters from across the U.S. One read, "I am the lady who called you who has M.S. ... I shot myself in the chest, not knowing exactly where the heart was. I aimed about two inches too far to the left. I had to do something while I was still able ... I am tired of fighting the M.S. I just want it over. I do not look forward to becoming a vegetable. Please help me." "I will debate so-called ethicists," he told Hull. "They are not even ethicists. They are propagandists. I will argue with them if they will allow themselves to be strapped to a wheelchair for 72 hours so they can't move, and they are catheterized and they are placed on the toilet and fed and bathed. Then they can sit in a chair and debate with me." In the middle of an argument, Kevorkian's eyebrows would shoot upward, his head cocking back, a slim finger jabbing the air as he talked about his work with death. "I analogize death to a dark cave. Now, if you are going into this cave by yourself, which everyone seems to do, you're terrified. But if I tie a big rope on a tree out here and I stand on the outside and I say, 'Don't worry, I'm here. You can go on in, and if anything happens, I can yank this rope back so you don't have to worry,' you can go in with a lot less fear. This is the rope that people need." Kevorkian's first patient  or victim, depending on your point of view  was Janet Adkins, a 54-year-old Portland, Ore., housewife who allowed herself to be hooked up to one of Kevorkian's suicide machines on June 4, 1990. She had been diagnosed with Alzheimer's disease the year before and had contacted Kevorkian after an experimental drug treatment she received at the University of Washington was unsuccessful. She had first seen him on a talk show and read about him in a magazine. Adkins, however, was not debilitated by her illness. Her personal physician, Dr. Murray Raskind, told TIME that she had told him that she and her husband were members of the Hemlock Society, a right-to-die organization, and that she had limited patience for Alzheimer's treatment. "When she entered the trial, she made it clear that this was a last chance. If the progress of the disease wasn't halted, then she didn't want to continue living." And then he got a call from Kevorkian. Raskind told TIME he vigorously tried to dissuade Kevorkian from taking her case. "My reasons were that she was in good spirits and seemed to be getting a lot of satisfaction from life. I was perplexed, but I didn't take [the call] as seriously as I should have. I consulted legal and medical colleagues. Then I called her family. Mrs. Adkins wasn't there. She was out playing tennis. I left a phone number for her, but she never returned my call ... When I heard the news, I was disappointed. I felt she had several years of good-quality life in front of her." Raskind testified against Kevorkian in an unsuccessful attempt to convict the Michigan doctor in Adkins' death. 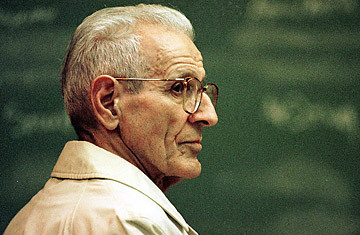 Requests for Kevorkian's assistance increased with each case, as did his notoriety and the court cases against him. The testimonials for and against him were both heart-wrenching and brutal. Always, however, Kevorkian evaded criminal responsibility by (so to speak) providing enough rope and never actually pushing open the trap door. Patients always self-administered, even though some early cases seemed to indicate actions that could be construed as changes of mind toward the end. But after years of working around legislation and lawyers, Kevorkian in 1998 showed a videotape of himself administering the dosage that led to the death of Thomas Youk, 52, who was in the final stages of ALS. With such clear evidence, a Michigan jury found him guilty of second-degree murder the following year, and he was given a 10-to-25-year sentence. He was released on good behavior in 2008, a decision perhaps ameliorated by the discovery that Kevorkian was suffering from hepatitis. The living embodiment of death in American pop culture, he continued to make television appearances and, after a period of quiet to satisfy his parole conditions, pushed his crusade almost as vigorously as before, though no longer assisting in suicides. His detractors continue to decry his methods, claiming they skirted the subtleties of psychology and other palliative alternatives, that the effectiveness of his death machines robbed the dying of a chance to consider other ways to see out their earthly existence. But Kevorkian almost reveled in the enmity he met  "the Inquisition," he called it. His confidence in the quest remained unruffled throughout. "It's unstoppable," he told TIME. "It may not be in my lifetime, but my opponents are going to lose. There's a lot of human misery out there."